Hi Guys and Girls So today i’m going to be talking about supplementation and what supplements are essential and what supplements you are wasting your money on. 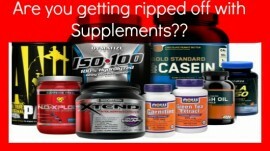 Alot of you are going into these shops not knowing what you need and don’t need and are coming out with €200+ worth of supplements that you do NOT need. So here is a quick info guide on what you should be taking. Alot of people will ask you, Why are you drinking protein shakes???? you can get it naturally from meat and fish. Which is correct and I will always promote real foods over supplements but when it comes to post workout nutrition a protein shake is more ideal. So the muscle can start the repairing process a lot faster and it’s also a lot handier because lets be honest last thing you want to do is eat 200g plus of meat or fish directly after you work-out, So a Protein shake (I prefer isolated whey) is a great way to get in 30-50g of protein which is ingested fast and pulled into the muscle to help repair the micro tears which were created during your weight session. Omega 3 fish oils are an extremely important supplement when it comes to training and everyday life. Omega 3′s are essential fatty acids that are commonly known for their anti inflammatory effect. this is the most common amino acid found in the muscles. Studies have shown that L-Glutamine can minimize breakdown of muscle during training and improve the absorption of protein. During a seriously intense workout, Glutamine levels are greatly depleted in your body, which in time decreases strength and recovery. It could take between 4- 6 days for Glutamine levels to return to their normal levels. These are branch chain amino acids. so where do i start….. BCAA’s are essential amino acids which are not produced in the body, so in order to make sure you are getting in all amino acids you need you should supplement with bcaa, this will help maintain a normal healthy immune system. When you go to the gym and lift weight you’re putting a huge strain on the body so taking a BCAA will help the immune system. Appetite suppressant the same goes for these. They are a gimmick and they will make you go in reverse, if you want your body fat to drop so you’re nice and shredded coming in at 6% body fat you need to increase your metabolism, and you do this by eating the right amount of fats Protein and carbs that your body needs. So suppressing your appetite (which they don’t do in the 1st place) is not going to help you. So how many of you pop down to the supplement shop to get your monthly stack and come out with a dozen protein bars because they’re so tasty so healthy and have a whopping 15g protein and 0 fat 0 sugar….which is complete bull S**t they are not healthy in the slightest they taste like Crap And you’re better off having a snickers and a protein shake(i know what I would prefer) these bars are very well advertised and they market them very well so the regular joe is fooled into buying a dozen when he/she pops into the shop for their monthly stack. Dont be fooled guys and girls.